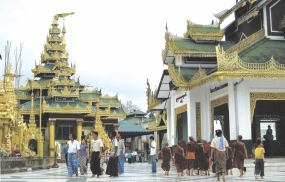 People walk in the compound of the Shwedagon pagoda, Yangon. If the reform efforts in Burma (Mayanmar) continue unabated, coupled with the visits of powerful foreign dignitaries, the once isolated nation could become a key player in the region. Since August, the rapid turnaround has led to all sorts of scenarios and expectations about Burma's future in the regional scheme of things. As long as the leader of the National League for Democracy, Daw Aung San Suu Kyi, stays engaged with the quasi-government of President Thein Sein, Burma's prospects for increased all-around international cooperation will continue. Ironically, for the time being, the flurry of diplomatic activity has been focused on Burma and its relations with the West. At the Bali summit, Asean leaders decided to support Burma's holding of the group's chair in 2014 in the hope that it would further reform. 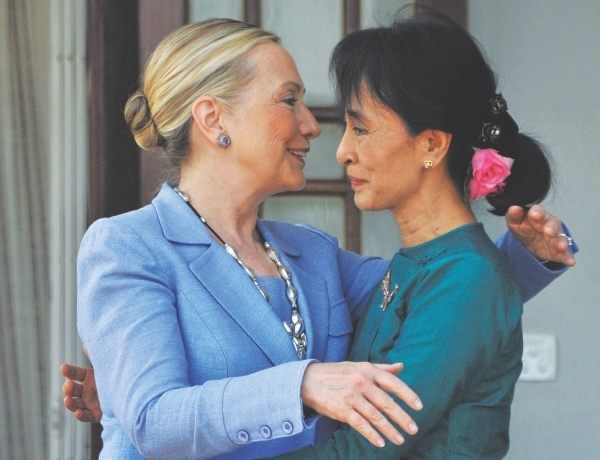 That decision has prompted Western leaders to visit and widen cooperation with Burma. The US has been the most assertive in forging ties and encouraging reforms there. The historic trip by US Secretary of State Hillary Clinton in November, and repeated visits by top US diplomats, is a barometer of Washington's high-risk diplomacy. Burma's path to reform could still take an unexpected turn; nothing is written in stone at this juncture. In fact, the release of a few political prisoners last week showed that there could be some tensions between the military and civilian leaders. Even Suu Kyi voiced words of caution when she met with British Foreign Secretary William Hague about the ongoing transformations. Strange as it may seem, enthusiasm among the West is far larger than within Asean in terms of visits and substance, as well as in providing further assistance both to Naypyidaw and Suu Kyi. For instance, since her release from house arrest in November 2010, Suu Kyi's guest list has been dominated by visitors from the West. Only a few Asean leaders have been included. Last month, Thailand Prime Minister Yingluck Shinawatra became the first Asean leader to meet Suu Kyi in what was widely seen as a photo opportunity. Before that, she had spoken only to former prime minister Abhisit Vejjajiva, Philippine President Benigno Aquino and Indonesian President Susilo Bambang Yudhoyono. Indonesian Foreign Minister Marty Natalegawa called on her twice during Jakarta's Asean chairmanship. Her numerous interviews with the media, mainly Western, seldom mention Asean and Burma's integration within it, if at all. It is an open secret that she is still uneasy about discussing this topic. Indeed, she was not happy with Asean's decision to back the Burmese chair, as she believed it should have waited for more tangible reforms. She has yet to meet with Asean Secretary General Dr Surin Pitsuwan. Her relations with Asean go back two decades to when she embarked on a democratic winding road without the grouping's support. Instead, Asean pursued its "constructive engagement" policy, which defended and tried to legitimise the oppressive Burmese military regime, eventually leading to its joining the group in 1997. After her release from her first six-year term of house arrest in July 1995, there was a fresh effort to mend fences through a scheduled meeting between her and Rangoon-based Asean ambassadors ahead of the Asean annual meeting in Brunei a week later. However, Burma's strong opposition forced the cancellation of the planned rendezvous. A subsequent letter from her submitted directly to Asean foreign ministers remains unanswered even today. In reality, Asean leaders do not respond to such letters, despite all their goodwill toward her. Throughout the subsequent years, she was under repeated house-arrest and her supporters abused, imprisoned and killed– not to mention the effort to halt overall democratic development in Burma. Only Western countries spoke out strongly and in some cases personalised her endeavours. They adopted tough measures including sanctions and took their cues from her. In her view, Asean has not fought for the Burmese people's rights. To be fair, there were three occasions on which Asean found the collective courage to defend her and criticise the Burmese government as an undeserving family member of the grouping. The first followed the brutal attack in Deyapin at the end of May 2003, in which more than 100 of her party's members and supporters were killed. Asean took a common stand asking for her release after she was again placed in detention. Asean wanted some degree of guarantee that no further attacks would be made on her or her supporters. The regime responded with a seven-point democratic road map. But overall, the Asean appeals fell on deaf ears. Asean-Burma ties almost reached breaking point between May-October 2003, when Asean leaders contemplated ways to reprimand Burma. Malaysian Prime Minister Mahathir Mohamad pressed Asean to expel Burma, even though he and ex-president Suharto had spearheaded the effort to admit the country in 1997. The second occasion came amid frustration in Asean at the government's intransigence. At the Asean summit in Vientiane in 2004, the leaders took a rare joint action forcing Burma to skip the Asean chair in 2006, with Rangoon citing domestic constraints as the reason. The third time was in New York on the sidelines of a United Nations meeting in New York at the end of September 2007. After a long and heated debate, Asean issued its strongest statement expressing "revulsion" against the killing of Buddhist monks and supporters of the democratic movement. It was at this crucial moment that Asean and the West, especially the US, held close consultations about their joint efforts to influence positive change in Burma. A few months later, Barack Obama was elected president of the US with a new policy focus on Asia, in particular Asean, which has paved the way for the present rapprochement with Burma. However, it is worth mentioning that during Thailand's 18-month chair from July 2008-December 2010, Foreign Minister Kasit Piromya tried to help Suu Kyi win her freedom by initiating a request for a pardon following a court decision convicting her of violating Burma's internal security law. But Asean could not reach a consensus due to strong opposition from the new Asean members. In retrospect, the evolution of Asean-Burma relations has contributed to the recognition the Thein Sein government now enjoys. Suu Kyi's role has been indispensable. The most frequently asked question today is: ‘What would happen if Burma had been left behind and not allowed to join Asean?’ Burma is emerging from its isolation. Suu Kyi is free and popular and giving hope to her people. Most importantly, Burma is no longer the pawn of India and China. If the ongoing reforms promote democratic developments, Burma could easily elevate itself as a key regional player, as Indonesia has succeeded in doing since its political transformation in 1998. Undeniably, Burma's two decades of oppression, strongly backed by Asean, have antagonised Suu Kyi and created a deep scar on her psyche. Everything that Asean did upset her; worse still, it consistently undermined her democratic struggle, not to mention prolonging the suffering of the Burmese people. The time has come now for both sides to show leadership to enable the healing process to begin. They must reach out to each other to reconcile past differences. They have to synergise strategies and efforts to ensure that there is no going back on the road to reform, and also to ease the country's regional integration. Only then can Burma become a worthy family member of Asean. This article was first published in The Nation. Reprinted with permission.